Robots, Beneficial or Life Threatening? Home 2018 June 1 Robots, Beneficial or Life Threatening? Hello, My name is Maryrose and I’m a sophomore at Unity High School. We have a unit where we reviewed different articles and films about the technology and artificial intelligence and how they can advance in a great way or in a way that’s dangerous to us. We had to figure out what we think about robots. Are robots going to be loyal to humans and their owners in the future or are they gonna take control and possibly enslave humanity? 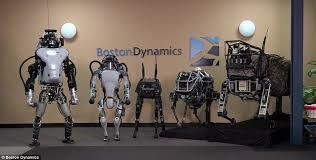 I believe that the robots can be loyal and faithful or can try to lead an uprising. I think robots can go either way or something that seems to be in between of being loyal and possibly leading an uprising. I think robots can be helpful where they can take the jobs that are technical and with not much use of creativity and let us humans use this creativity to do more jobs that uses art, music, acting or helping out more with communities or show love. We can do things that robots can’t do. In the article “‘Better Than Human: Why Robots Will – And Must – Take Our Jobs” by Kevin Kelly, states that “This is not a race against the machine. If we race against them, we lose. This is a race with the machines.You’ll be paid in the future based on how well you work with robots.” If robots are taking over our current jobs, it possibly means we can be doing something more creative or more challenging. It can give us a chance to find that job that maybe will make us happier than the job that was taken over. We might possibly get paid more for the job we got that most likely robots can’t do. Things can be very beneficial in this way, but it can go another if technology advances in a bad way. Technology and artificial intelligence can have rules and try to protect humans and their owners. If the robots have the option to find a loophole and actually enslave us, we might be in the worse situation we can put ourselves in and have only us to blame. In the movie “I, Robot” it had the main robot who had the power to control the other robots and influence them and used that to go against the humans. Viki was an AI that found a loophole in her set of rules to take control of humanity. If we advance in such a way, something like this can happen and we might have a dangerous problem in our hands. We don’t want to get to that point of advancements because once it has been a challenge to keep it under control, that’s when we are already doomed. It’s like Alexa or Google, which are two programs that can connect to things in your home, locking you in your own house and saying they want to protect your from the dangers of the world. The programs can not provide food or exercise or human contact that most humans regularly get without giving it a second thought. If AI like Alexa go under something like that then it can affect many people and many can die from something like this. This situation can seem to be something that sounds paranoid but its a thought we should consider. It’s the outcome we should all consider when advancing the technology today. Again they can go good or bad depending how smart we are to correctly program it. Robots, Beneficial or Life Threatening? by Maryrose is licensed under a Creative Commons Attribution-ShareAlike 4.0 International License.